Protesters in Bahrain demanded democracy and the ouster of Prime Minister Sheikh Khalifa bin Salman al-Khalifa, a member of the Sunni Muslim royal family who has held the post for four decades. He is seen as being mostly concerned with keeping the ruling family's grip on politics and the economy. 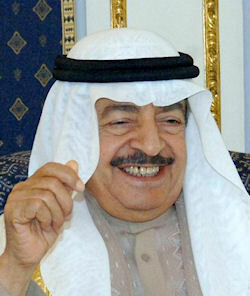 Prime Minister Sheikh Khalifa bin Salman al-Khalifa is uncle of King Hamad, and should not be confused with Bahrain Defense Forces Commander-in-Chief Marshal Shaikh Khalifa bin Ahmed Al Khalifa, or with His Highness Sheikh Khalifa Bin Zayed Al Nahyan, President of the UAE and Ruler of Abu Dhabi. H.H. Shaikh Khalifa bin Salman Al-Khalifa was born in 1936, and he is the second of 3 sons born to the former Amir of Bahrain the late Shaikh Salman bin Hamad Al-Khalifa. He is married and has two sons and a daughter. He attended primary and secondary schools in Bahrain and went on to higher education in London, England. Shaikh Khalifa started his working life at the age of 19 as an assistant in the office of his father, before becoming a member of the Rents Committee in 1954. It was his first experience with housing issues in Bahrain; issues that were to positively influence his actions on national housing policies many years later. Appointed head of the Council of Education in 1956, he was charged with the development and modernisation of the educational system in the country. It is due to these reforms, the foundation stones of the present free and compulsory state education systems, that has enable Bahrain to obtain a literacy rate of over 90%, the highest rankings in education according to the UN, in the Arab world. Shaikh Khalifa held many concurrent subsidiary posts and headed many committees throughout this time. During, his presidency of the Monetary Council for Bahrain, he initiated the issuance of a national currency to replace the Indian Rupee, possibly the most important single step in the country's development, one that would be instrumental in the rise of Bahrain as a modern financial center in later years. Although a British protectorate, local affairs in Bahrain had been governed, since 1920 by an elected Municipal Council. In 1962 Shaikh Khalifa was elected Mayor. It was during this era that he undertook a rationalization of the various departmental functions of the Municipal Council establishing the nucleus of what were to become on independence the Ministries of today. In May 1966 Sheikh Khalifa took over the reins of the Presidency of the Administrative Council, working in parallel with the British authorities, so on independence in 1971, it was a natural step to become head of the Council of Ministers that oversaw the transition of power. 1953, Assistant in the Court Office of his father the Ruler. 1954, Member in the Rents Committee. 1956, President of the Education Council. 1957, Member of the Electricity Committee. 1957, Member of the Civil Service Committee. 1960, President of the Irrigation Council. 1962, Chosen Chairman of the City of Manama Municipality. 1962, Chairman of the Monetary Council. 1964, President of the Foreigners' migration and residence issues. 1965, Chairman of the Administrative Council. 1966, Appointed Chairman of the Administrative Council, which was considered as Council of Ministers at that time. 1970, The State Council with Shaikh Khalifa as its President replaced the Administrative Council. 1971, The State Council was substituted by the Council of Ministers, and ever since that time H.H. Shaikh Khalifa bin Salman Al-Khalifa has been Prime Minister of the Kingdom of Bahrain. He is also: Head of the Supreme Defense Council, Chairman of the Monetary Council, Higher Council for the Civil Aviation, Higher Committee for Projects, the Council of Petroleum, Water Resources Council and the Supreme Council for Civil Service. In December 19th, 1979, H.H. The Late Amir of Bahrain Shaikh Isa bin Salman Al-Khalifa awarded Shaikh Khalifa the "Khalifite Medallion" which is the highest Order De-Merit in the State. H.H. is highly interested in international economics and political affairs. Personal hobbies include Reading, Horticulture and Photography. Throughout a working life spent entirely in the service of Bahrain, H.H Shaikh Khalifa the Prime Minister of Bahrain has been honoured by many Heads of State, Universities and Internationalo Oganizations. Standing out amongst his many accolades and none more warmly received or acclaimed by both the people of Bahrain the Arab World and His Highness was his winning of the Special Citation of the Habitat Scroll of Honour for 2006. The Special Citation is bestowed on individuals, who have shown extraordinary commitment to the improvement of conditions of people living and working in poverty. Winner of the UN 2006 Special Citation of the Habitat Scroll of Honour. His Highness recieved the award at the United Nations in Geneva on the 2nd July 2007. It was presented by the Secretary General of the United Nations Mr. Ban Ki-moon for his impressive efforts in uplifting the living standards of all Bahrainis through a concerted focus on poverty alleviation and modernization while preserving the cultural heritage of his country. The Secretary General stated that for over the last quarter of a century Shaikh Khalifa had helped to lift the Kingdom of Bahrain from what was largely a collection of rural villages into a thriving and diversified economy and that it was inspiring to see that this has been done while providing social welfare support and focusing on educational opportunities and jobs for all.